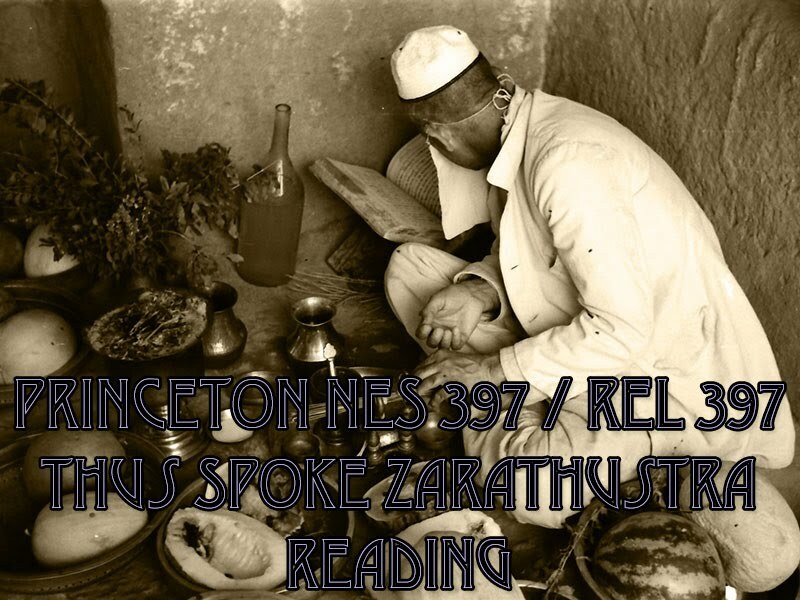 This week's reading comes from a short Zoroastrian Middle Persian text called The Book of Advice of Zarathustra (Pand-nāmag ī Zarduxšt), which was probably composed sometime before the ninth century CE. The text encapsulates the knowledge that a Zoroastrian should have of his or her religious tradition by the age of fifteen. As such, the text serves as an epitome of the religion as it existed in that time, and brings up a number of the fundamental concepts of Zoroastrianism that we will be discussing throughout this semester. As you read the text, note the details that strike you about the text – what is familiar to you, and what strikes you as being different? Bring your questions and observations to class, as we will be discussing aspects of the text as an introduction to the Zoroastrian tradition. Selection from The Book of Advice of Zarathustra. SPIRIT, pp. 192-195. In this week's readings, we survey the field of Zoroastrian studies. In the SPIRIT reading, we are introduced to a number of Zoroastrian concepts, deities, and technical terms as defined by a scholar of Iranian philology and linguistics. The INTRODUCTION reading, written by a historian of religions, also provides a general overview of the religion, connecting the living Zoroastrianism of today with the Zoroastrianism of the ancient past. How do these texts compare with one another? Can you notice any differences in the assumptions that the authors make? If so, what are these assumptions, and how might they affect the study of Zoroastrianism? In our final reading for this week, "Once upon a time, Zoroaster," Clarisse Herrenschmidt examines the history of the field of Zoroastrian Studies by looking at how different scholars have perceived the character Zarathustra. As you read the article, think about what the different schools of thought are about Zarathustra. How would you approach the figure of Zarathustra given what you know so far about the available historical sources? "Introduction to Zoroastrianism,” SPIRIT pp. 1-38. “Zoroastrianism: An Introduction" and "Chapter 1: Zoroastrians Past and Present," INTRODUCTION, pp. xvii-xxiv, 1-29. Herrenschmidt, Clarisse. 1987. “Once upon a Time, Zoroaster.” History and Anthropology 3, pp. 209-237. In this week's readings, we begin to survey the Gāthās, the oldest texts of the Zoroastrian religious corpus. First, we will read translations of several key passages from the SPIRIT reading. Though it is not mandatory, I invite you to look for other translations of the Gāthās in the library and on the world wide web, and to compare them with Skjærvø's renditions. Using what you now know about the history of Zoroastrian Studies, where do you think Skjærvø positions himself within the debate about the historical Zarathustra, and how does this affect his translations? Keep these questions in mind as your read his "Literature of the Most Ancient Iranians," in which he provides an outline for his approach to the Gāthās. On Thursday, we will continue to read from the Gāthās, and through the Boyce reading, will get a very different perspective from Skjærvø. What do you make of all of this? Do you find either approach more plausible? As you do your readings, do not be put off by the apparent archaism of the Gāthās. The texts often raise questions of interpretation which even the most experienced translator is at a loss to solve, so be sure to bring your questions to class. "Texts on Creation from the Old Avesta," SPIRIT pp. 44-49. Skjærvø, Prods Oktor. 1996. “The Literature of the Most Ancient Iranians.” Proceedings of the Second North American Gatha Conference. pp. 221-235. "Zarathustra and the Gathic Characters in the Gāthās" SPIRIT pp. 122-130. Boyce, Mary. 1997. “Origins of Zoroastrian Philosophy,” in Companion Encyclopedia to Asian Philosophy, eds. Brian Carr and Indira Mahalingam, pp. 5-23. London: Routledge. Skjærvø, Prods Oktor. 2003. “Zarathustra: First Poet Sacrificer,” in Paitimāna. Essays in Iranian, Indo-European, and Indian Studies in Honor of Hanns-Peter Schmidt, ed. Siamak Adhami, pp. 157-194. Costa Mesa, CA: Mazda Publishers. “Ritual Texts from the Old Avesta and the Young Avesta,” SPIRIT, pp. 214-220. Kotwal, Firoze & James Boyd. 1991. Part 1 from A Persian Offering: The Yasna. Paris: Association pour l’avancement des études iraniennes. Skjærvø, Prods Oktor. 2007. “The Avestan Yasna: Ritual and Myth”. in Religious Texts in Iranian Languages, ed. Claus V. Pedersen and Fereydun Vahman, pp. 57-84. Copenhagen: Det Kongelige Danske Videnskabernes Selskab. "Hero-sacrificers of the First Ages in the Young Avesta," and "Zarathustra and the Gathic Characters in the Young Avesta" SPIRIT pp. 113-122, 130-138. Hinnells, John. 1973. “Ancient Persian Mythology” from Persian Mythology, pp. 27-41. London: Hamlyn. Vevaina, Yuhan S.-D. 2010. "Hubris and Himmelfahrt: The Narrative Logic of Kay Us' Ascent to Heaven in Pahlavi Literature." In Ancient and Middle Iranian Studies: Proceedings of the 6th European Conference of Iranian Studies, ed. Maria Macuch, et al. pp. 231-243. Wiesbaden: Harrassowitz. Choksy, Jamsheed. 1989. Chapters 1, 4, and 5 from Purity and Pollution in Zoroastrianism: Triumph over Evil. Austin: University of Texas Press. Williams, Alan. 1997. "Zoroastrianism and the Body." In Religion and the Body, ed. Sarah Coakley, pp. 155-166. Cambridge: Cambridge University Press. de Jong, Albert. 1999. "Purification in Absentia: On the Development of Zoroastrian Ritual Practice." In Transformations of the Inner Self in Religious Traditions, eds. Jan Assmann and Guy Stroumsa, pp. 301-329. Leiden: Brill. "Texts on the History of the Sacred Tradition." SPIRIT, pp. 39-43. Kreyenbroek, Philip. 1987. “The Zoroastrian Priesthood After the Fall of the Sasanian Empire,” in Transition Periods in Iranian History: Actes du Symposium de Fribourg-en-Brisgau (22-24 mai 1985), ed. Philippe Gignoux, pp. 151-166. Leuven: Peeters. Vevaina, Yuhan. 2010. “’Enumerating the Dēn:’ Textual Taxonomies, Cosmological Deixis, and Numerological Speculations in Zoroastrianism.” History of Religions 50: 111-143. "Chapter 2: The Ancient Persians: Truth-Tellers and Paradise-Builders" INTRODUCTION, pp. 31-64. Skjærvø, Prods Oktor. 2005. “The Achaemenids and the Avesta,” in Birth of the Persian Empire, eds. Vesta Curtis and Sarah Stewart, pp. 52-84. London: I. B. Tauris. No readings. Good luck next week! "Chapter 3: A Zoroastrian Presence from Seleucia to Sistan: The Parthian Period" and "Chapter 5: The Zoroastrians of Central Asia," INTRODUCTION, pp. 65-98, 135-158. Grenet, Frantz. 2007. "Religious Diversity among Sogdian Merchants in Sixth-Century China: Zoroastrianism, Buddhism, Manichaeism and Hinduism." Comparative Studies of South Asia, Africa and the Middle East 27: 463-478. "Chapter 4: Eranshahr. The Sasanian Center of the World," INTRODUCTION, pp. 99-134. Williams, Alan. 1996. "Zoroastrians and Christians in Sasanian Iran." Bulletin of the John Rylands University Library of Manchester 78: 37-53. Secunda, Shai. 2009. “Talmudic Text and Iranian Context: On the Development of Two Talmudic Narratives.” AJS Review 33: 45-69. Thursday, 11/8: Towards a Zoroastrian Orthodoxy? Shaked, Shaul. 1994. Chapters 1, 4, and 5 from Dualism in Transformation: Varieties of Religion in Sasanian Iran. London: School for African and Oriental Studies. Boyce, Mary. 1996. “On the Orthodoxy of Sasanian Zoroastrianism.” Bulletin for the School of Oriental and African Studies 59: 11-28. Crone, Patricia. 1994. "Zoroastrian Communism." Comparative Studies in Society and History 36: 447-462. "Creation and the Divine World from the Pahlavi Texts." SPIRIT, pp. 75-112. Kreyenbroek, Philip G. “Cosmogony and Cosmology i. in Zoroastrianism/Mazdaism,” – Encyclopedia Iranica. Sheffield, Daniel J. 2009. "The Wizirgerd ī Dēnīg and the Evil Spirit: Questions of Authenticity in Post-Classical Zoroastrianism." Bulletin of the Asia Institute 19, 181-189. Lincoln, Bruce. 1983. “The Earth Becomes Flat: A Study of Apocalyptic Imagery,” Comparative Studies in Society and History 25/1: 136-153. Shaked, Shaul. “Eschatology, i. in Zoroastrianism and Zoroastrian Influence,” – Encyclopedia Iranica. Choksy, Jamsheed. 2002. Chapters 3 and 4 from Evil Good and Gender. New York: Peter Lang. de Jong, Albert. 2003. “Women and Ritual in Medieval Zoroastrianism,” in The Fire Within: Jamshid Soroush Soroushian Memorial Volume II, eds. Carlo G. Cereti and Farrokh Vajifdar, pp. 147-162. New York: 1stbooks. Gould, Ketayun. 1994. “Outside the Discipline, Inside the Experience: Women in Zoroastrianism.” In Religion and Women, ed. Arvind Sharma, pp. 139-182. Albany: SUNY Press. "Chapter 6: Gabr-Mahalle: Zoroastrians in Islamic Iran." INTRODUCTION, pp. 159-188. Choksy, Jamsheed. 1997. Chapter 3 from Conflict and Cooperation: Zoroastrian Subalterns and Muslim Elites in Medieval Iranian Society. New York: Columbia University Press. Sheffield, Daniel. 2012. "Miracles in the Age of Mixed Iron: Sacred Narratives of Zarathustra in Islamic Iran and the Notion of Syncretism in Zoroastrianism." Unpublished manuscript. "Chapter 7: Parsipanu: Zoroastrianism in India." INTRODUCTION, pp. 189-216. Williams, Alan. 2009. Chapters 1 and 5 from The Zoroastrian Myth of Migration from Iran and Settlement in the Indian Diaspora. Leiden: Brill. Hinnells, John. 2008. "Changing Perceptions of Authority among Parsis in British India." In Parsis in India and the Diaspora (John Hinnells & Alan Williams, eds. ), pp. 100-118. London: Routledge. Sharafi, Mitra. 2008. "Judging Conversion to Zoroastrianism: Behind the Scenes of the Parsi Panchayat Case (1908)." In Parsis in India and the Diaspora (John Hinnells & Alan Williams, eds. ), pp. 159-180. London: Routledge. Hinnells, John. 2005. Chapter, 1 & 3 from The Zoroastrian Diaspora: Religion and Migration. Oxford: Oxford University Press. Choksy, Jamsheed. 2006. "Despite Shāhs and Mollās: Minority Sociopolitics in Premodern and Modern Iran." Journal of Asian History 40: 129-184. Luhrmann, Tanya. 1996. Chapters 1-3 from The Good Parsi [Prologue optional]. Cambridge, MA: Harvard University Press.